The end of her infamous run in the Washington suburbs is as cloaked in intrigue and drama as her arrival. Madame Giselle said said her possessions were valued for insurance purposes at $1.5 million. The swanky apartment where the mystery woman told her tales has been emptied out. The fine crystal baubles have been boxed, the exquisite carpets rolled up, the artwork stuffed roughly into the back of a rented truck and taken away under cover of night. All that remains of the shadowy woman known as Madame Giselle, a charmer with a taste for the high life and a knack for extracting large sums of money from unwitting neighbors, are shopping bags full of foreign court files, and questions. So many questions. Such are the remnants of a carefully constructed, then hastily unassembled life of deceit. The end of her infamous run in the Washington suburbs is as cloaked in intrigue and drama as her arrival. A woman who burst onto the social scene of a clubby, upscale apartment building in Chevy Chase, Maryland, with tales of jet-setting glamour and unusual access to the powerful, has slipped away in a fog of suspicion and unpaid rent. Madame Giselle, as neighbors called her, went by the name while she lived in a luxury high-rise apartment. She boasted, according to neighbors, of being the secret wife of Egypt's president, the ex-wife of Venezuelan leader Hugo Chavez and a mentor to Ivanka Trump with a White House office. In the three months since The Washington Post detailed allegations by neighbors who say they were swindled by Giselle, her once-charmed life has grown more perilous. In Colombia, where she is known as Giselle Jaller - a judge has sentenced her to 11 years in prison in a multimillion-dollar fraud case involving a Spanish bank, though she remains free during the appeal. 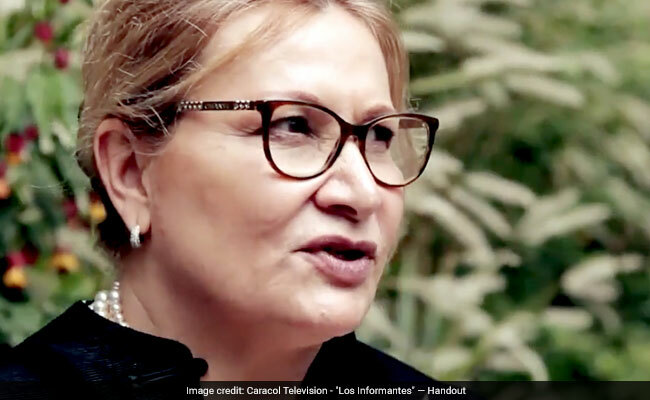 In Panama, a former president's confidants have alleged that she tried to trick him into paying her tens of thousands of dollars with promises of securing political asylum. In Montgomery County, Maryland, federal investigators have been making inquiries about her activities. The U.S. Attorney's Office declined comment. Giselle has denied wrongdoing. In response to written questions, she sent emails portraying herself as a victim of BBVA, the bank she is accused of defrauding, an argument that has been rejected by the Colombian courts. "I HAVE EVERY PROOF THAT THE BBVA OWE ME 40 MILLION DOLLARS I WILL NOT STOP UNTIL THEY WILL BE JAILED," she wrote. Giselle, now 58, embodied international sophistication to the friends she made in Chevy Chase. She talked about how the Secret Service had a key to her apartment, according to text messages, and she boasted of using private jets. But it all began to unravel in the past year as two neighbors started digging into her past. The neighbors claim Giselle bamboozled them into giving her $70,000 in cash to fund a fake business that would sell T-shirts to the Venezuelan army. One neighbor has a pending fraud lawsuit in Montgomery County. In the months since the Post's article was published, a cascade of other accusations have been made against Giselle, and she appears to have resettled in Bogota. 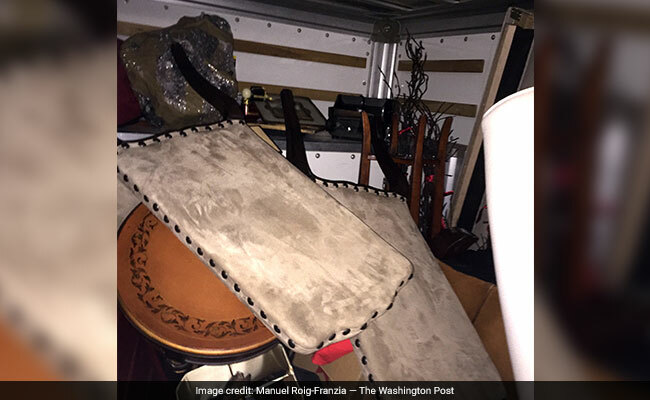 Madame Giselle's furniture and art, which she said were worth $1.5 million, in a van. Abelardo de la Espriella, an attorney for former Panamanian president Ricardo Martinelli, has accused her of a brazen scheme. Martinelli is detained in a federal detention center in Florida on corruption charges. Giselle contacted de la Espriella last summer, he said in an interview, offering to help Martinelli get political asylum in exchange for a payment of $36,000 per member of his family. Giselle claimed to be a Harvard-trained lawyer, though there is no evidence that is true, de la Espriella recalled. She bragged about being close to U.S. Attorney General Jeff Sessions and being "like a mother" to Ivanka Trump, de la Espriella said. "I thought it was very strange," de la Espriella, who first made his allegations to the Colombian newspaper El Tiempo, said in an interview. Nonetheless, he said, Martinelli told him to explore the deal. De la Espriella and his investigators dredged up past scandals, learning that Giselle had admitted to stealing her sister's identity in the 1990s and had been accused of conning the Colombian military out of hundreds of thousands of dollars. They read about how she'd escaped justice by fleeing the country until the statute of limitations for her alleged crimes expired. They saw that she'd been given a nickname by the Colombian press: La Mona, or "The Blonde." "It was clear she was a professional swindler," de la Espriella said. They refused to make the deal, and reported their allegations to federal law enforcement officials in the United States, he said. 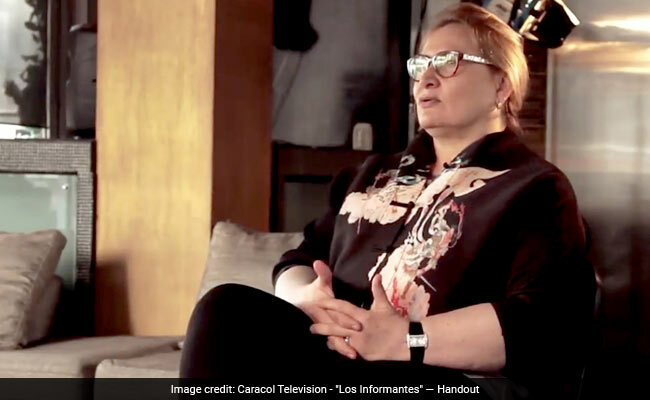 Giselle did not deny having contact with the former president's team, but told El Tiempo that she had only suggested that Martinelli's attorney spend $35,000 on an asylum study. She asserted she never claimed to be a Harvard-trained lawyer. Last November, she also sat for a lengthy interview with a news program in Colombia with her Louis Vuitton bag in hand. She proclaimed her innocence and repeated her assertion that she had been married to Chavez, saying the FBI was aware of the relationship. "I think that I am among the people in the world who guards the most secrets of presidents," she said on the program "Los Informantes." All the while, Colombian authorities were accusing her of trying to defraud the Spanish bank BBVA of $20 million. She had been represented by one of Colombia's most famed attorneys, Jaime Lombana, whose clients have included former Colombian president Alvaro Uribe. But by November when a crucial hearing was held in her case, she had parted ways with Lombana and was represented by a public defender, according to Colombian court records. She was allowed to appear by videoconference and sought to turn the glare of accusation onto the bank, arguing unsuccessfully that allegedly corrupt officials had actually swindled money from her, according to Colombian court records. She was sentenced to 11 years in prison, a decision now under appeal. As her legal crisis deepened, her toehold in the United States was slipping away. She wasn't paying her rent at her apartment in Chevy Chase. Her building began eviction proceedings, culminating in a court order expelling her for failing to pay more than $9,000, according to Montgomery County court and sheriff's department records. In her interview on Colombian television, she had said her possessions were valued for insurance purposes at $1.5 million. When it came time for her to vacate the apartment she had once boasted about, no professional moving crew arrived. Still, there was a flurry of activity at the apartment in the final hours before sheriff's deputies and an eviction service called Your Outta Here Eviction arrived to formally eject her. Several people were spotted racing in and out of the apartment, hauling valuables into the hallway and down to the loading dock. A man in camouflage pants answered a knock at the door. He said Giselle was not there. But he would say little about what he was up to, and less about the whereabouts of the apartment's enigmatic former inhabitant. Asked where he was taking Giselle's possessions, he said they were being donated to an African Methodist Episcopal church in Washington. He initially said he was a member of the church, then said he was merely a mover. He declined to give his name or the name of the church. "People need things all day," he said. Down at the building's loading dock, he stuffed the contents of Giselle's apartment into a rental truck. An elegant white sofa was tipped into the dusty corner of the truck, alongside a delicate, wooden end table and a large silver platter that a neighbor recalled once held the Turkish coffees Giselle would serve. The man in the camouflage pants drove the truck out of the building's parking lot, speeding south and eventually coming to a stop, parking illegally across from a coffee shop at 14th and U streets in Northwest Washington. He shuttled between the coffee shop and a liquor store next door for nearly an hour, then guided a man in a ski cap across the street. He rolled up the truck's tailgate and showed him what was inside. Then the man in the camouflage pants closed up his truck. He glanced down the block, and drove away into the night, adding another layer to the mystery of Madame Giselle.